It is not often that you come across a book that is an absolute delight to read and spans across your spectrum of interests. 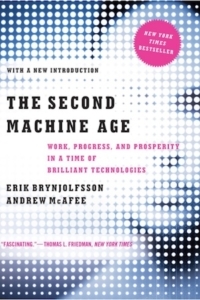 The Second Machine Age was that book for me and I can unequivocally say that it is one of the best books I have read. The bar was set high for The Second Machine Age as I had just finished reading Superforecasting: The Art and Science of Prediction by Philip E. Tetlock and Dan Gardner and I immensely enjoyed that book as well. Super forecasting almost inspired me to dust off the crystal ball I had retired to my garage and start predicting again by joining The Good Judgment Project but then my battle wearied senses prevailed. In the two short years since The Second Machine Age was published we have already seen glimpses of the future offered by the book unfold. New innovations such as Uber’s decision to launch a fleet of self-driving taxis in Pittsburg is one example of the future discussed in The Second Machine Age. As a computer scientist with an interest in finance and economics the book appealed to me on multiple levels. The book is so well written that you neither need to be a computer scientist nor an economist to read it. Just as the industrial revolution (the first machine age) and the green revolution increased the standard of living and made food more abundant, the second machine age is going to usher in new bounties for humanity and at the same time is likely to cause a lot of disruption. So what exactly is the second machine age? The second machine age is the advent of self-driving cars, the 3D printing of custom prosthetics or aircraft engine parts, it is the use of deep machine learning to defeat the world’s best Go player and it is a vision of having 1 million robots at FoxConn assembling your next iPhone amongst other things. What I really love about this book is not just the behind the scenes look it offers of the second machine age, but also the recommendations it provides to both individuals and governments about how they can harness the power of rapid technology driven advances and deal with the inevitable displacement caused on account of it. 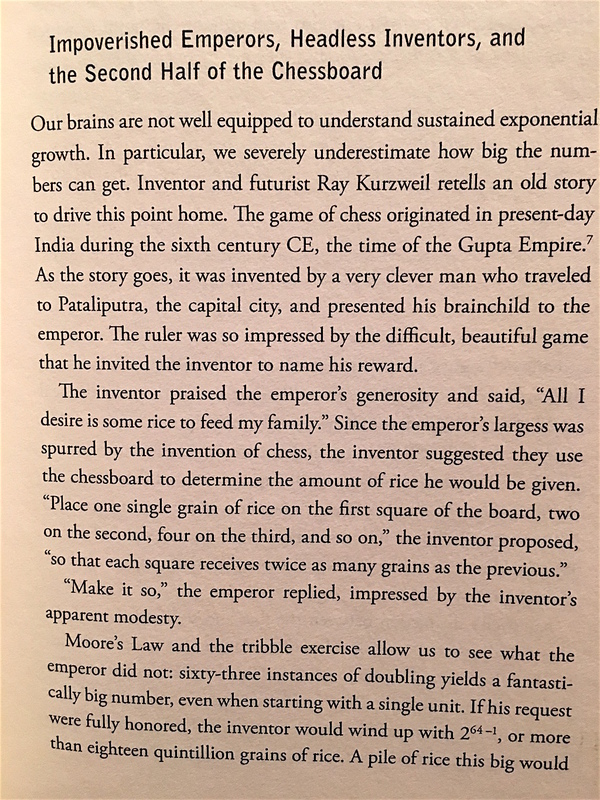 One of the more interesting anecdotes from the book that helps the reader visualize the rapid pace of innovation is given below. I was not surprised to read in the acknowledgements section of the book that the authors consulted with a large group of leading thinkers (or geeks as the authors call them) from the fields of economics/social sciences and technology. A series of lunches held at MIT that got both these groups together led to discussions related to the topics the authors cover in this book. You can learn more about the authors and follow them on Twitter here and here. I read the book “The Singularity is Near” by Ray Kurzweil, and I am also a fan of the Singularity University he is a part of. That book really brings to light what your article here says about the coming machine age. We humans are linear thinkers, and are not remotely close to understanding what exponential events can do to us. We will need nano bots in our brains to do that.